The Ontario MP who left the governing Liberals to join the Conservative Party on the day lawmakers returned for the fall sitting on Parliament Hill says Canada’s role in the world was a major factor in her decision to cross the floor. Aurora-Oak Ridges-Richmond Hill MP Leona Alleslev appeared on CTV’s Your Morning Tuesday and was asked why she crossed the floor. “It’s all about understanding the things that really matter,” she responded. Alleslev said she felt the Conservatives were more “focused on those fundamental challenges” than the party she had left. Alleslev, a former officer with the Canadian Air Force, won her seat in Parliament by a narrow margin in 2015, edging past her Conservative challenger by slightly more than 1,000 votes. Asked how her constituents felt about her decision to switch parties, Alleslev she had heard a lot of unhappiness from them over the summer, prior to Monday’s floor-crossing. “They’re not happy with the things that are going on. They wanted tax reform – comprehensive tax reform,” she said. Alleslev added that she had received “overwhelmingly positive” feedback about her decision to leave the Liberals. Conservative Leader Andrew Scheer, who joined Alleslev on Your Morning, was asked if he had talked to any other MPs who may be considering crossing the floor. Citing issues around “trust and confidentiality,” Scheer did not answer directly. He said he had heard from people who supported the Liberals in the 2015 election who plan to switch their votes in 2019. “This is never done in a way where it’s ‘sit down and make a plan,” he said. Alleslev was named the Conservatives’ critic for global security after she joined the party. Disappointed reactions to her defection continued to come in from Liberal quarters Tuesday, including from the president of the Liberal riding association in Aurora-Oak Ridges-Richmond Hill. In a statement posted on Facebook, Clayton Haluza said he found it a “struggle to understand” why Alleslev had switched parties. “I had no prior knowledge of this event, and it was done without my consultation,” he said. 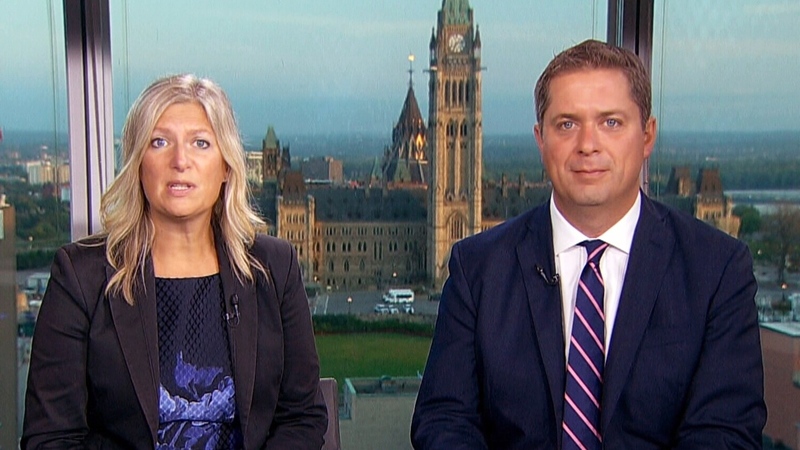 Aurora-Oak Ridges-Richmond Hill MP Leona Alleslev and Conservative Leader Andrew Scheer appear on CTV's Your Morning on Tuesday, Sept. 18, 2018.